Now, I need to feel like cooking, and that doesn’t happen often, especially with my woman so eager to take on that chore. But desperate times call for desperate measures. She had told me I had stuff to make pizzas (I used to know such things about my own fridge). So, it was ‘go time.’ Whole wheat pizza dough was waiting for me; I just needed to knead it, flatten it, work it a bit. It smelled a little vinegar-y, so that scared me (but not enough to cease operation). Now, I do have some skills in the kitchen, truth be told; the thing is, it is more of throwing things together into a massive goulash-type deal (I am the self-proclaimed “Koncoction King”). The next logical step, then, was just to start tossing things on top of this canvas. Pesto, garlic, lil grated parm, some diavola tomato sauce, dashes of pepper and pizza spices.. pretty much no rhyme or reason. 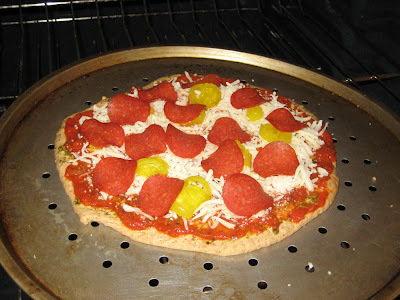 Top with some Red Hot, fat free mozzarella, and lean turkey pepperoni. Oh yeah, I am a freak with the lowfat etc, so this was all on the healthy tip. I guess you can tell there will be no recipe to follow, but I baked this bad boy at about 400 degrees for 20 minutes or so (who the hell really knows). Check out the pics. Not bad… not bad at all! Well this was fun. Ladies, holla for a man who cooks!! Wait - what’s that Steph? What dishes need to be cleaned...? but… but…I’m blogging. Hah! Holla indeed. That pizza looks delicious. AWESOME. go john! you are funny! You did a great job and gave me a laugh!! It looks yummy! Hahaha! I love this post! And now I'm in the mood for pizza. Steph, e-mail me your address. I'll send you some Malt O Meal! Oh funny! That pizza looks quite good! 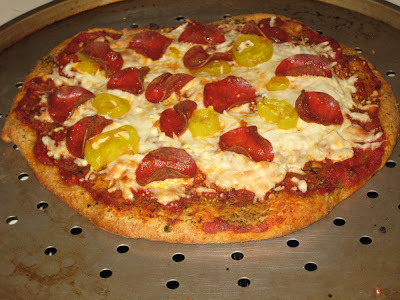 I love homemade pizza, I make it all the time - yours looks delicious! Yes you are, J.L. And it was good! The secret is out. Giddyup! This? Was just completely awesome! My favorite parts: "I baked this bad boy at about 400 degrees for 20 minutes or so (who the hell really knows)" and "but ... but I'm blogging"! LOVE it!!! Hilarious! Can't see my husband doing that so I'm a little jealous. He'd hijack my blog and discuss current market conditions which may be a nice lesson for everyone but not near as entertaining as this.